Heat oven to 350°F. Spray 13x9-inch pan with cooking spray. Make cake as directed on box for 13x9-inch pan. Cool in pan on cooling rack until completely cooled, about 30 minutes. Spread chocolate frosting on top of cake; sprinkle with chocolate cookie crumbs. Use green icing to make garden rows, using photo as guide. Insert toothpick halfway into base of each PEEPS® marshmallow bunny. Insert bunnies, toothpick side down, into cake. Use orange and green icings to make carrots on cake, using photo as a guide. Cut into 4 rows by 3 rows to serve. 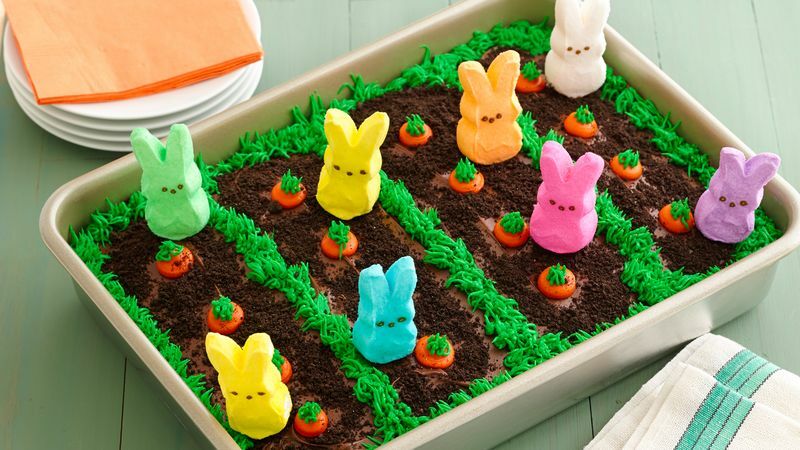 Add color and variety to your cake by adding a few Easter-colored PEEPS® marshmallow chicks to your garden, too!